Agency – teaching jargon destined for overuse? I have blogged about the concept of student agency before as I continue to explore what it means to me, my practice and in terms of leading a school. I have to be honest and say that I am disappointed that it seems as though agency and agentic have become the new trendy phrases in schools destined for overuse and misuse. Reminds me of the term life-long learning or 21st century learners which was dropped into every conversation and used to encompass everything associated with current effective approaches to teaching and learning. It got to the point where many cringed when the words were used. So now the urge to do so is back with teachers describing their practice as supporting agentic learners, a point which I would question. I would suggest that perhaps a lack of professional learning has led to this happening with the phrase being coined without a full understanding behind it. Perhaps that is a little harsh and on a continuum of developing agentic learners they are simply at the initial developmental end. Maybe my understanding is what is a fault or I can’t get beyond the pureness of agency. This post has been prompted by a couple of discussions where people have described their agentic practices. For example, Teacher A having a ‘Must Do Can Do’ approach in their classroom suggesting this is student agency, or Teacher B stating a ‘reading contract’ type approach (filled with teacher generated activities) as being agentic. I do not see that simply providing an element of choice = agency, especially when these are secondary often unmonitored activities that play a distant second place to instructional learning directly with a teacher. So here is my attempt to define what makes agentic learning from my perspective, not based on any research, just a what’s on top, Friday evening, as I dig deeper into this area. Firstly, a couple of key concepts that guide my thinking. The foundation for student agency is teaching and learning grounded in assessment for learning practices. We need to remove the assumption that quality learning only happens when students are working directly with a teacher. Let me take a little time to unpack those further. Teacher identifying teaching points and addressing them throughout learning. Teacher and peers providing feedback and next steps. Student uses data to determine next steps in their learning. Student sources examples of the learning or expertise to focus and guide. Student develops their own personalised success criteria. It would be fair to say that many teachers, certainly that I know of, implement parts of the 2nd column, but I don’t know any (myself included!) that have reached the stage where all of it is happening consistently and is the norm. Maybe because the following concept was not in place..? We need to remove the assumption that quality learning only happens when students are working directly with a teacher. Most educators are familiar with the concept of a flipped classroom, where content is provided prior the lesson enabling rich discussion and learning activities that use rather than learn the content. Take that concept and adapt it to working with the teacher/working independently in class. Traditionally we would place emphasis on time with the teacher, with the independent activities practicing and reinforcing already learnt content and skills. What if that was flipped over and teachers instead emphasised and prioritised the independent activities? Is this not when the teacher truly becomes the coach and facilitator of learning, deliberately allowing for agency to be developed? This approach is a fundamental change, and one that I would suggest requires a very knowledgeable and effective teacher, with the ability to design independent contexts that are personalised, challenging, that require the students to make decisions about their learning, in an environment or culture where everyone is supporting each other to develop their own process of agency. I am not an expert in this area but the concept of agency is something that fits very comfortably with my beliefs on teaching and learning. My thoughts may be at odds with others in terms of what agency is. However, I just hope that when the terms is used it is used appropriately and knowledgeably, otherwise I fear it will join the scrap heap of overused education jargon before the full potential of the concept has been given the time to embed itself if the everydayness of teaching and learning. Sometimes I wonder if the removal of professional learning programmes such as Assess to Learn (AtoL) was a big step away from the foundations and principles of what we want our students to do and become. ePortfolio presentation given at a CORE Education Breakfast Seminar. View more presentations from Nick Rate. This report and a series of case studies has recently been released by JISC. The publications relate to eportfolio practice in Higher and Further Education contexts in the UK. While that in itself is quite far removed from the primary classroom in New Zealand, whenever the words formative and eportfolios are mentioned in the same line I am naturally curious, due to my own research into the relationship between the two. Firstly some nuts and bolts stuff. The case studies unpack eportfolio practice in 34 institutions, asking a range a questions/prompts including the context to who is assessing the eportfolio, the tool used and its’ social networking ability and reference to the pedagogical support and summative/formative assessment implications. The question and prompts in themselves are quite focused and almost suggest a criteria of what should or shouldn’t be used in a successful eportfolio implementation. Regarding the tool used, the predominant option for eportfolios was either PebblePad or BlackBoard based with other options including Plone, Joomla, Elgg, Moodle, WordPress, ePet or a self developed in house system. The report itself has some useful parts. The discussed benefits of eportfolios reinforce the concepts we already are familiar with. I found Table 2, the Matrix of e-portfolio functionality and pedagogical/administrative value against case studies the most useful as it cross references criteria to particular case studies in order to find out more. The terms ‘formative’ and ‘summative’ do not describe different types of assessment. They refer to the purpose of the assessment, the use to which it is put. The summative purpose of assessment is to identify educational achievement as a matter of public record, for use in selection and certification. The formative purpose is to provide information to the learner and others concerned with the process of learning about the learner’s progress, strengths and areas for improvement. Practitioners often refer to assessment used for formative purposes as ‘feedback’. Or maybe that highlights the difference between the educational sectors, primary vs. tertiary and primary vs. secondary. I see formative assessment (better labeled as assessment for/of/as learning) as being distinctly different from summative assessment. Yes you can use summative assessment formatively, as is almost suggested above, but formative assessment is so much more than that. Student control, student ownership, student understanding. Yes feedback is a component of that as is the learner’s progress, strengths and areas for improvement, but so is effective questioning, co-construction, exemplars, peer and self assessments, ongoing reflections… how does eportfolio use in HE and FE support such strategies? Are existing assessment structures and expectations holding these institutions back from letting go and giving ownership and responsibility over to the learner? My formal teacher inquiry for the year is continuing to develop, not a fast as I would have liked but none the less there is progress. The broad goal of the inquiry is to increase quality feedback from parents in the students’ portfolios, and therefore contributing to improved student achievement. We know that feedback has a huge impact on improving student learning through the research from such people as Hattie, Black and Wiliam and Clarke. Our AP at school has also blogged about it here highlighting our school’s belief on the importance of feedback. Last term focused on getting the students involved in giving each other quality feedback on their peers learning. This was structured, modeled and discussed with the students and success criteria co-constructed. A great start to providing quality feedback! Time was specifically set aside for the feedback to take place. It was planned for and valued rather than a last minute or accidental. I think that your art is great!!!! I really like your quote. You didn’t have any dead space and it doesn’t look like you have rushed it. You also have the same style writing as Colin McCahon. Next time you should blend your colours more. 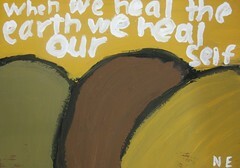 I really like your Colin McCahon art work. I like how you put your picture into three different segments but you could have used a thinner brush and made it a bit more smooth. I think that you kept it really simple, you used a great range of colours! Next time I think you could blend your colours a bit better. Hi, I think that your Colin McCahon art work is really good but I think that you could have blended a bit more and use more colours. I like it how you used lots of sections and I like your colours. Your crossword was a bit challenging some of the clues I didn’t really get but I figured it out in the end. I think you need to make your clues a bit more easier next time. I think that it was great because it was hard but not to hard. Next time I think that you should have photo of a snake as well. Wow that was hard. Your colours where good and you had interesting words and great synonyms. You needed to have picture that were related more to the thing you were talking about. 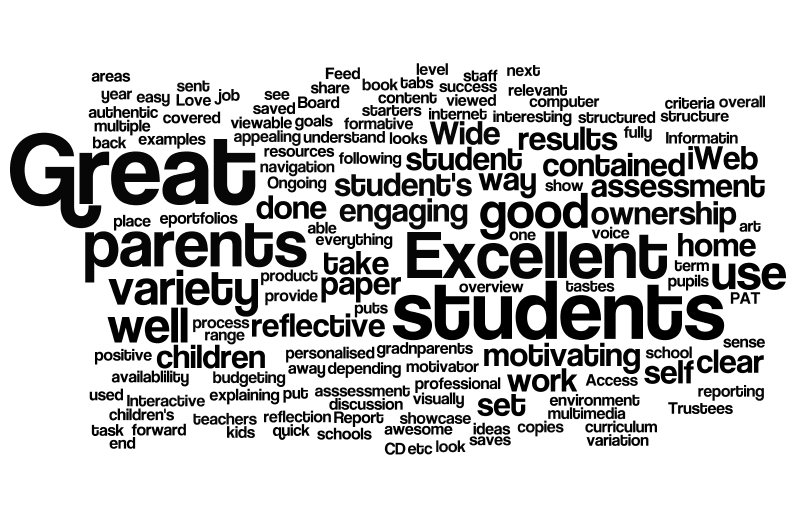 These are just a selection of some really great examples of student feedback. The inquiry focus in the classroom context will be to make seeking and receiving peer feedback a natural part of the learning process. At the moment this is very much a teacher directed part of their learning. The second focus of the inquiry leading into the term is with the students themselves taking their understanding of how to give quality feedback home to their parents and involving them in giving quality feedback on learning. I look forward to the students taking on board the role of the teacher in engaging their parents in this process. Our Education Edition of Google Apps allows access to the suite of apps not only for the staff at school but also the students. All students in my class have their own account allowing them to use Gmail, Chat, Docs, Video, Sites and Calendar within our domain. Students exclusively use Docs for their formal written language. While the initial planning or brainstorming phase may or may not be completed digitally, the complete draft-share-feedback-improve-publish-share process is completed within the Google Apps environment. 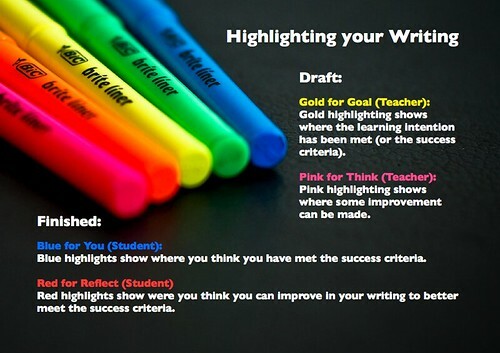 We have a school-wide approach to giving feedback on written work, where highlighters are used to indicate where or how a student has met the success criteria (gold) or areas that can be improved (pink). We use the phrases Gold for Goal and Pink for Think to reinforce this process. Due to the process being completed digitally and the availability of colours in the Docs highlighting palette, I have extended upon the use of gold and pink highlights to include blue and red for the students to use in their self-assessment reflection cycle. These are shown below in the image I generated for use as a poster around the classroom. Student writes 1st draft of writing and checks independently against the success criteria. Improvements made. Student shares writing with teacher (or another student). Teacher/student highlights text as required in pink or gold and provides additional written prompts to improve writing. Student improves writing as per teacher/student feedback. 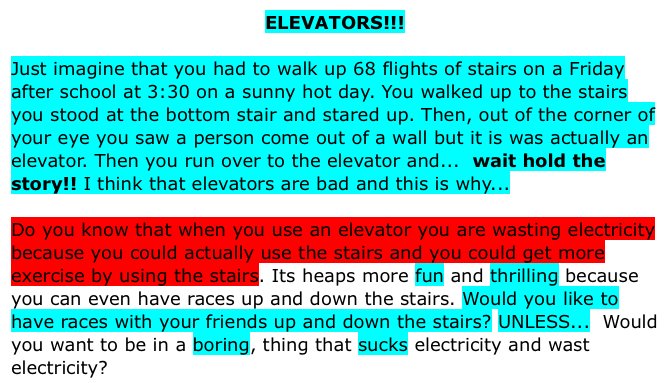 Student completes own assessment with blue and red highlights. The process works extremely well in terms of a reflective learning cycle. I will stress however that this process does not replace face to face feedback and conferencing. It is perhaps best viewed as a checkpoint in the learning to formalise some of the ongoing learning conversations. The process also clearly indicates how a student responds to feedback and guidance on how to improve their learning. I think this is a really good example of how Web 2.0 tools, when grounded in sound pedagogy, really do help facilitate improved learning. I would recommend you give it a go even if you only trial it with a small group of children! I have spent the last three days working with the Nga Tii Roa Learning Cluster in the Bay of Plenty. The schools involved (Otamarakau, Pongakawa, Rangiuru, Te Ranga, Pukehina and Paengaroa) are currently part of an EHSAS cluster focusing on enhancing writing standards and assessment for learning. They are interested in using eportfolios to help facilitate this development. This was a follow up visit from a teacher who attended my ULearn08 workshop last month. We began with an after school session for the whole cluster and then day two was spent with lead teachers and those with a particular interest in developing eportfolios within their schools. A couple of teachers also joined us from Lynmore School. This proved to be a valuable session with lots of discussion about the purpose of the eportfolios and looking at the best tool for the job. I used the following slides to generate a discussion on how an eportfolio has multiple purposes due to the different perspectives that the stakeholders bring. Before you can select the appropriate tool you need to make sure it meets all of the purposes. Fit the tool to the purpose not mould your purpose to fit the tool. The third slide shows the criteria we used when selecting our eportfolio tool. Purpose of portfolio agreed upon with learner. I argue that it is not this concise and that the purpose of a portfolio is multi-dimesional. The purpose of a portfolio for a parent can be significantly different than the teacher and students. This is particularly so with younger students who see the purpose of the portfolio to, “Show Mum and Dad what I have been learning.” Trying to negotiate and agree on the purpose of the portfolio as being an embedded tool that helps them to become self-regulating and self-directed in their learning is a little to abstract for them. Our eportfolios fulfil a number of purposes and not all of these the student can articulate but this does not make them less formative. They are still student-centered and student-directed and feed forward to improving student learning. They are eportfolios that facilitate assessment for learning despite the fact that the purpose is not necessarily agreed upon with the learner. Was is important is that the teacher, who facilitates the process, bases what is happening on sound pedagogical strategies and while the student may not understand or see this purpose until they are older and more aware of their learning, it under pins the whole process. One thing that is certain is that Barrett’s comparison of digital portfolios that are either formative or summative never fail to generate a good discussion. I also had the opportunity to work with the Te Puke Principal’s Association giving them an overview of my research and the outcomes. We had difficulty establishing an Internet connection on their machines so we used a Hot Potatoes quiz I had saved locally instead of a Google Docs form. Some of them wanted to use this with their staff so here it is. Some activities to initiate discussion throughout our workshop. Activity 3: OF or FOR? Another ULearn08 Assessment for Learning and ePortfolios workshop activity involved workshop attendees completing a quick PMI of our old ePortfolios created in iWeb. 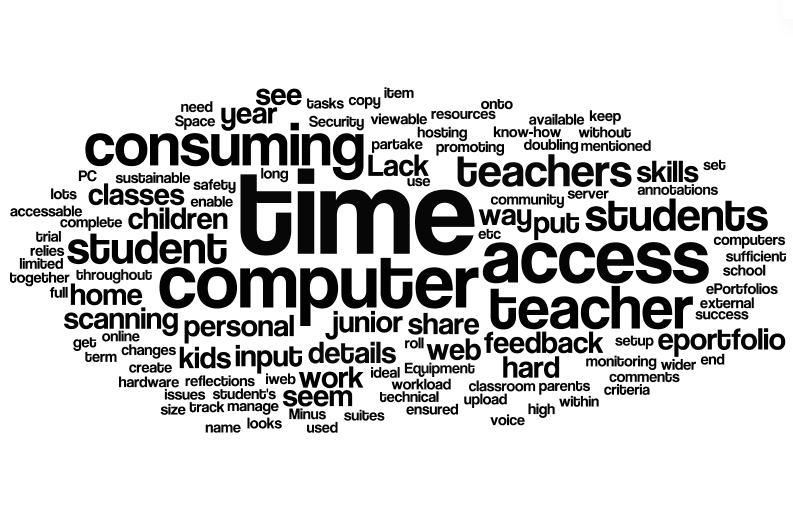 I have used Wordle to share the results. The plus. Nice to see students and parents up there as coming to the front of the positives, as well as a variety of learning examples. The minus. This sums it up really: time comsuming, issues over access to computers and eportfolios for updating, and access to published eportfolios for feedback. The interesting. Not really highlighting anything, without an attached explanation. It is always good to get an outside view of what is happening. Often we are so use to something that we don’t see the downside. 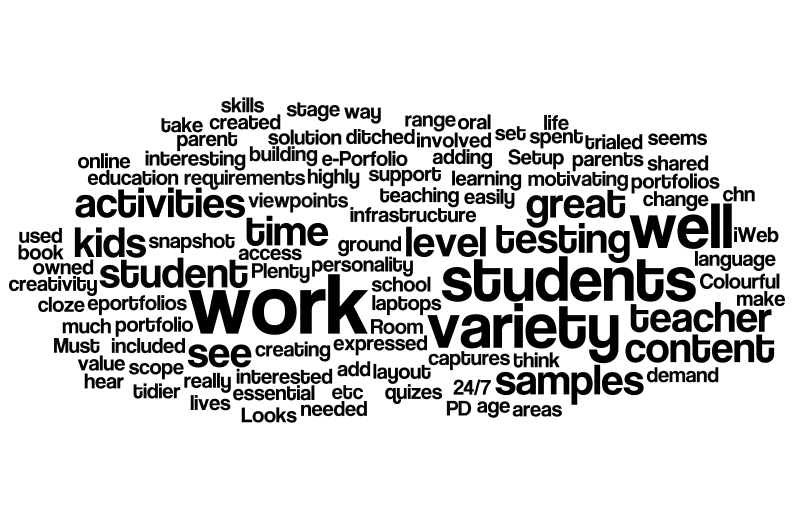 Although wordle is not the most accurate analysis, it does provide a snapshot of ideas. In this case it was great to see a lot of consistency between these ideas and our own reflective process after using iWeb as our ePortfolio tool. Links to activities for uLearn08 workshop Assessment for Learning & ePortfolios. Please do not complete any of the surveys until during the workshop! Activity 3: Portfolios – Assessment of or Assessment for Learning? Here is an abridged version of my uLearn 08 workshop presentation, minus any audio or video content, activities, links and of course the all important commentary. If I have time, a slidecast version will be added in the future. Any feedback would be welcome either here or on SlideShare.